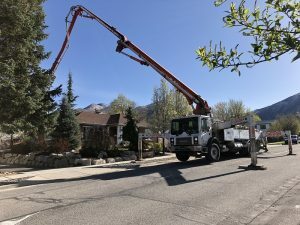 It’s not often you see a huge concrete pump looming over your house, but it IS pretty exciting! 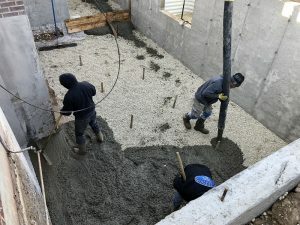 Having poured the footing and foundation walls several days before, the next step is to pour the basement floor slab. The framers have also been hard at work on the interior installing beams where bearing walls were removed. They are also adding temporary supports in anticipation of the removal of the exterior walls to enable the extension of the kitchen and great room. 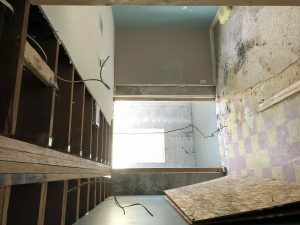 As the contractors start working to modify the old structure and add the new, it is common for questions to arise regarding how everything will come together. 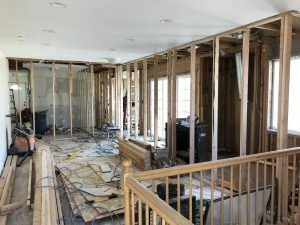 It is critical that all the members of the team (homeowner, contractor, architect, and interior designer) are communicating to make sure the solutions are in line with the original life-centered intent of the design.